The Sikorsky S-58ET is a medium-weight multi-role utility twin pac coupled turbo shaft powered helicopter accommodating up to 16 passengers and 2 crew. The Sikorsky S-58T is a development of the single piston-engined Sikorsky S-58 also known as the CH-34. On 30 January 1957, the Sikorsky HSS-1F Seabat flew first. In fact was this the first tuboshaft-engined Sikorsky S-58. The Sikorsky HSS-1F was a flying testbed for the General Electric T58 turboshaft engine. The airframe was modified to accept two GE Model XT58T engines. However the T58 turboshaft engine gave the Sikorsky S-58 a significant power-to-weight advantage ratio, just a single turboshaft engined S-58 was converted at that time and the Sikorsky S-58 in production remained piston-engined. However, the Sikorsky CH-34 was also built and developed under license in the United Kingdom by Westland Aircraft from 1958. This company introduced Westland Wessex. The Westland Wessex was derived from the Sikorsky S-58, a free-turbine supplanting the original piston engine. The Wessex prototype flew first on 20 June 1958 and the model entered service in 1961 with the Royal Navy. In 1970, Sikorsky announced it was developing a turboprop conversion package for the S58. With the turboprop coversion package, the lifetime of the Sikorsky CH-34 airframes that were withdrawn from use with the military operators could be lengthed. Turbine conversion with Pratt & Whitney PT6 Twin-Pac, comprising two PT6 engines and combining gearbox; improved performance includes greater speed and lifting power, and better hot-and-high operation. The first S-58T conversion flew on 19 August 1970. The turboprop-engined S58T was initially fitted with a Pratt & Whitney PT6T3 twinpack turboshaft. Later aircraft were fitted with a Pratt & Whitney PT6T6 twinpack turboshaft. In April 1971, Sikorsky received FAA approval for the S-58T Twin Pac-powered turbine conversion for S-58 airframes. Sikorsky set up a production line to convert customer S58s, offered kits for S58 operators to perform the conversion and purchased used S58s, like most of the Sikorsky H-34 Choctaw helicopters that were withdrawn from use 1972-74 in Germany. The converted H-34 helicopters were offered for sale as Sikorsky S-58T. One hundred and forty-six conversions, or conversion kits, were produced until the rights were sold to California Helicopter International in 1981. Sikorsky S-58ET c/n 58-721 was built in 1957 for the Federal Republic of Germany as a H-34G.I Choctaw powered by a Wright R-1820-84B radial air-cooled engine. Sikorsky H-34G-I Choctaw c/n 58-721 was delivered to the Federal German Army (Heeresflieger) and entered service as PB+201 with HFS-2. The H-34G.I Choctaw was able to carry up to 12 passengers and with its range of 535 km the helicopter was very useful for the German Army. In service with the Heeresflieger the Choctaw was re-serialed QB+461; PM+461; PL+331 and in 1967 as 8004. The Choctaws in service with the Federal German Army (Bundeswehr) were replaced between 1971 and 1973 by the Sikorsky CH-53G and withdrawn from use. Choctaw 80+04 was sold to Sikorsky and registered N47787. It was rebuilt as a S-58ET powered by the Pratt & Whitney Aircraft of Canada PT6T-6 Twin Pac coupled turbo shaft. This conversion permitted the S-58ET to carry up to 16 passengers at a maximum speed some 16 mph (26 km/h) higher than the S-58s 122 mph (196 km/h) over slightly longer ranges, with the additional safety of a twin-engine power plant. After the conversion, the helicopter was registered with Placid International Oil Ltd, Dallas (TX), and shipped by boat to Amsterdam where the helicopter arrived on 5 April 1975. KLM undertook the necessary modifications to adapt the helicopter for flights over the North Sea, and from then on provided the crew and maintenance. Registration N47787 was cancelled on 10 April 1975 as exported to the Netherlands and the next day the Sikorsky S-58ET was registered PH-POC with KLM Noordzee Helikopters B.V., Schiphol-Oost, as operator and Placid International Oil Ltd., Dallas (TX), USA, as owner. 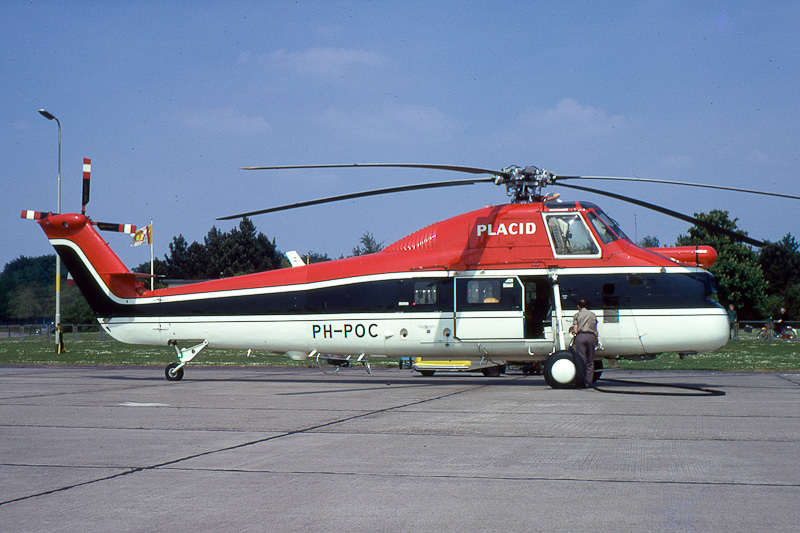 The helicopter was painted in Placid's colours and the registration letters 'POC' stood for Placid Oil Company. KLM Noordzee Helikopters flew this helicopter out of the municipal heliport in Den Helder for serving the oil and gas rigs in the North Sea. On 6 September 1977, the registered operator name changed to KLM Helikopters B.V.. In 1980, the helicopter was sold and registration PH-POC was cancelled on 21 February 1980. The same year, the Sikorsky S-58ET was registered PK-OBO with Airfast Services Indonesia P.T., Singapore-Seletar. After being withdrawn from use by Airfast, Sikorsky S-58ET PK-OBO was dismantled at Seletar in 1997.